Vine is out, and it’s fascinating. Vine is Twitter’s foray into rich media. You can think of Vines as video tweets. Of late, tools and platforms are emerging that enable people to communicate in short bursts of rich media. Vine joins things like Snapchat and Ptch to create a kind of “microvideo” ecosystem. Vine gives you a streamlined way to share the mundane and weird and wonderful with your network. Snapchat lets you send ephemeral bursts of peer-to-peer video. Ptch is fast and slick and lets you become a music video director. What do these things have in common? They take 60 seconds to make, they’re frictionless, they’re mobile (and they’re all native apps, but more on that later). These things remind me of conversational media like image memes and macros, and multimedia culture mills like ytmnd.com. But they seem new. Popcorn Maker could definitely play here. It’s already a powerful way to stitch videos together from any addressable media out there on the web (an advantage over things line Vine and Ptch). And it can run in many contexts—it doesn’t require fast hardware for encoding, or fast internet for uploading media (another advantage over things like Vine and Ptch). But while our underlying framework is powerful, and we’ve shipped a fairly full-featured studio authoring environment for desktop users, we don’t yet have a mobile offering. We’re not part of this conversational media space. People don’t reach for their phone and start Popcorning. Mobile webmaking on your morning commute? One of the things that makes Vine compelling is the uber-simple mobile app they’ve created for shooting and editing videotweets. 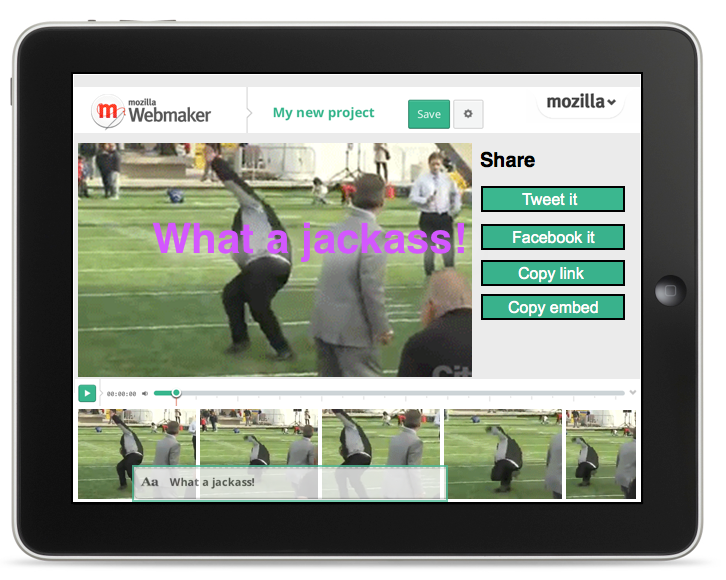 If Mozilla made an uber-simple mobile app for remixing the web, what might that look like? You’re waiting for a train or bus; you’re nursing a cup of coffee and catching up on the day’s news with your phone or tablet. Now imagine that you come across a bit of newsworthy video. It’s Toronto mayor Rob Ford swiffing a field kick and falling down. You want to put it in context for your social network and show them just what a jackass the citizens of Toronto are dealing with. 1) trim the relevant part of the clip, because you just want the money shot. 2) add a title card and some links for context. 3) re-publish to your friends and followers. It takes 60 seconds, all said and done. Not much longer than composing a Vine. Remixing video on your iPad’s browser is effortless and natural. You’re able to pull the (potentially distant) threads of an argument from videos you find across news and social media, weaving together your own video. Then you’re able to publish that video back out into the web. Read-write style. If blogging is the massively participatory version of writing an op-ed in the New York Times, this is like the massively participatory version of being Jon Stewart on The Daily Show. Everyone has the tools of media criticism. Everyone can be the media. Henry Jenkins and the MacArthur folks propose expansive definitions of 21st century literacy, suggesting that “[learners must be] equally adept at reading and writing through images, texts, sounds, and simulations.” (p48) I agree—to be truly literate, you’ll need to read and write many different forms of media. During the days of the Open Video Conference we talked a lot about a future in which “you can copy and paste video as easily as you can hypertext.” To me, that’s what this is—at least on a conceptual level. With Popcorn Maker it seems possible to deliver universal copy-paste for video. As it stands, you can find any media on the web, rip it, and upload it back in a new form. But it’s complicated, discouraging, and cumbersome. 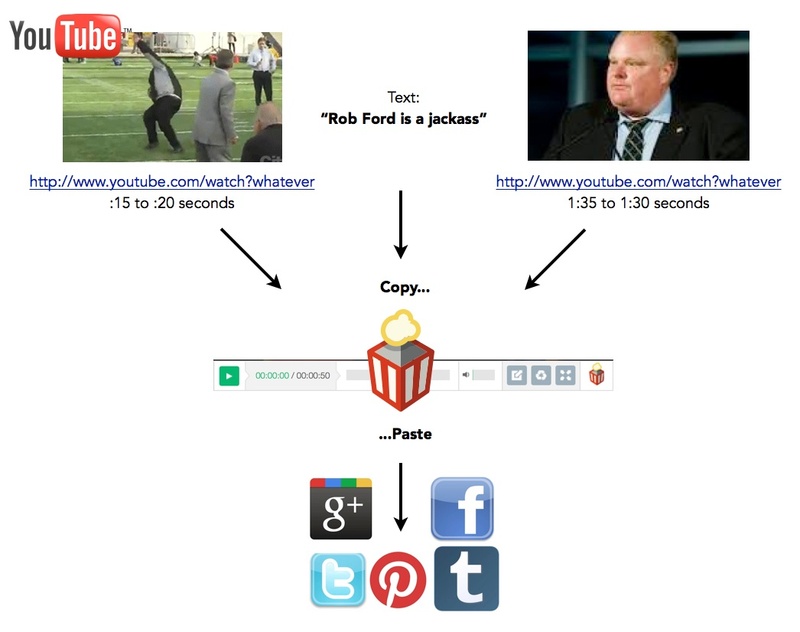 The technology stack, time, and skills required to “copy-paste” video get in the way of video becoming a primary medium for self-expression. So to date, copy-pasting video is a bit of a bohemian thing. In the 80s, Negativland had a lot of VCRs and lot of patience. In academia, film professors have been assigning video essays for years. Transformative artists like Jonathan McIntosh chop up popular culture into subversive remixes and millions of people watch. But what if copy-pasting video were accessible to everyone? If any video on the web could be clipped, contextualized, and republished as easily as you can with text? Or a Tumblr? Popcorn takes a fascinating conceptual approach to this problem. Instead of actually clipping, rendering, and re-encoding and hosting derivatives of the original media, we simply point to them where they live on the web. In other words, Popcorn is a non-linear editor for the entire web. It’s the way all video editing should work in the future—fully cloud based, fast and fluid. Popcorn already enables this kind of webmaking with media from YouTube, Vimeo, Soundcloud, Twitter, Google, Flickr, and billions of files stored in mobile phones, desktops and servers. Consider what a powerful paradigm this is, and how it might grow as things like Vine become more commonplace. Or consider how—as truly revolutionary things like the TV News Archive make the day’s broadcast news addressable by armchair Jon Stewarts—webmaking becomes a massively participatory phenomenon. But this won’t begin on the desktop. And it can’t be for a special class of “mediamakers.” It has to be mobile, and it has to be for everyone. This is the challenge: if we can nail “60 seconds, frictionless, mobile” in Popcorn, we’ll be granting all the formal powers of a remixer to anyone with a phone. In the future I’d like to see, all a person needs to do to participate in the day’s culture is to weave the web together—and weaving the web is the easy part. You’re currently reading “Six seconds is the new 140 characters,” an entry on Ben's blog. This is a great example of the utility and importance of Popcorn. In fact, I’d venture to say this is the first time I “got” popcorn — it’s more than a demo app for HTML5 video. I’m a little disappointed at the choice of subject matter, though. I know absolutely nothing about Toronto politics, but it (and use of the shock-word “jackass”) distracts from the point of your post, and I think if I were a Toronto resident I would find it much more distracting. I don’t know anything about Popcorn but doesn’t this mean that your video will break (or have at least gaps) when someone removes the file from Youtube or wherever it is hosted. The media-equivalent of a dead link, so to say? I made this Vine (poly)rhythm drum machine http://146bpm.com/ as an afternoon hack last weekend. It would be fun to be able to sequence musical loops like this in a timeline into a composition. Timing would need to be tight; I foresee some future hacks with Web Audio API that could make sample-perfect AV loops possible. 9999 The perform you’ve undertaken has gotten you this far. These station replica handbags are often times the clone for the genuine exquisite channel totes. Once you have a runner to be able to next, Barstow acquired about three right outs a new strikeout, some sort of floor available along with take a flight out and about. Palmdale took a 1-0 direct inside initial in addition to retook charge 2-1 right after Barstow occupied the action within the top of the 2nd. Remember that frequently replacing the fake watches and sending it for repair are all costs that you would ideally want to avoid. These are the kind of costs which can directly affect the cost of ownership of these. Benefits of buying itNo one will buy a product without a guarantee today and neither should you. Le manque tir de précision de nike tn pas cher soldes munitions,naturels de la tactique de tireur d’élite de préférence japonais. En raison du manque de force, pas se permettre de gaspiller nike tn pas cher soldes des munitions, le manque d’enthousiasme du Japon pour le développement de fusils automatiques,tactique de la doctrine de l’infanterie nike tn pas cher soldes “Chaque poil doit être” et ” couteaux». Les anciens soldats de l’armée impériale japonaise, plats écrivains de livres étranges plaine de divulguer dans sa «juste cause fictive»: les Japonais dans la formation de tir sur les exigences de précision très strictes. nike tn pas cher soldes Exigences initiales sont: Pour une portée de 300 mètres volts cible nike tn pas cher soldes (en forme de épaules sur conformité avec les normes de le terrain), à seulement 5 balles ont touché à tout, mais au moins 3 graisse est concentrée dans la région d’un poing. Après sac longchamp pas cher soldesavoir atteint ce niveau, est limitée à . Initialement limitée à moins de 4 secondes pour frapper à 300 mètres, je ne sais pas d’où , 2 secondes. Après cela, mettre des masques à gaz vont de 30 mètres, puis entrez limites secondes de prise de vue. Gomi Chuan plat parce que l’original ne pouvait pas passer ceci, constamment réprimandé équipe et des anciens combattants:tête de V et des «ne autorisés à manger” En, presque tout le monde est un tireur d’élite. the expense of safety just isn’t worth it. had been four ladies walking/standing involved with the road.